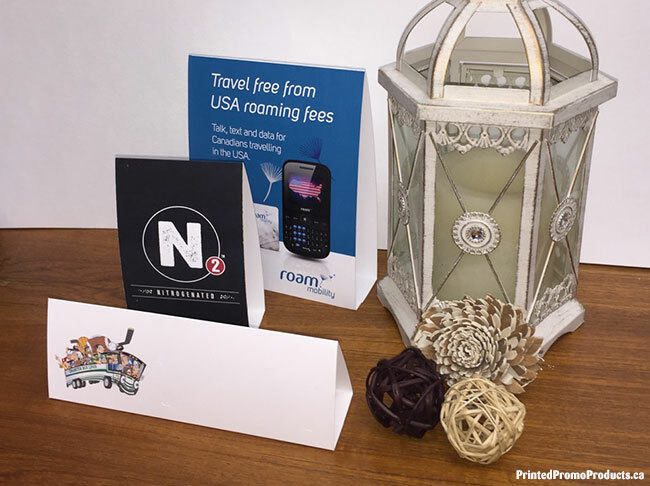 Custom table tent cards are a great way to get your latest special noticed as well as a perfect medium to display a menu or new product. 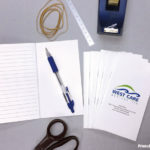 Tent cards are supplied flat, pre-scored, digital or offset printed in full colour on 100lb gloss card stock. Sizes include 7 1/2″ x 4″ (horizontal) • 8 1/2″ x 3″ (horizontal) • 3″ x 5″ (vertical) • 3 1/2″ x 5″ (vertical) • 4″ x 5″ (vertical) • 4″ x 6″ (vertical). Custom sizes available as well as 3 sided (triangle) tent cards. Minimum order is 100 units. If you’re interested in ordering custom tent cards, please contact us for a quotation. Visit our Paper Products page to see what other business marketing products we make. Type, borders and logos should be 3/16″ in from product edges on all sides. For orders with bleeds (an extra amount of printed image which extends beyond the product edge), extend this image or background colour 1/8″ on all sides. Artwork files accepted: AI, PSD, EPS, and PDF at 300ppi/dpi. Create fonts to outlines and embed all links. A PDF proof will be emailed before production begins. A printed colour proof is available at an additional charge. Production time is 5 to 6 working days. Time will vary for large orders. 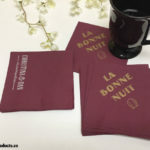 We custom print all your tent cards on site at our Vancouver, BC location. 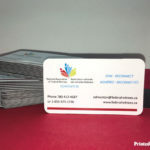 Table tent cards are digital printed in full colour (CMYK). RGB and Pantone® colours will be converted to CMYK. Larger orders will be offset printed. Visit our buttons, coasters, stickers and fridge magnets pages. Also, take a look at our Idea Guide, which provides popular promotional products for various industries and events. We deliver to individuals and businesses across Canada daily, small towns to large cities. We have accounts with a number of local and leading couriers including FedEx, Purolator, UPS, Canpar and Canada Post. So delivering to Victoria, Edmonton, Calgary, Regina, Winnipeg, Montreal, Toronto or Halifax is no problem. We can also take care of your shipping needs to the USA. Contact us for a shipping quotation.